Premium Quality by Sferra Bros. From Italy.luxurious pillowcases made of high quality "Long-staple cotton" which produces greatly enhanced durability and an exquisite, silky soft texture. These exquisite pillowcases bring comfort, design and impeccable quality together flawlessly. 100% Cotton Percale. The Italian fashion house built on lasting elegance in apparel design, now turns its expertise to creation for bed and bath. Twin Two Flat Sheets With Cord Trim. Machine wash warm. A botanical pattern enlivens the soft neutral palette of this Devon cotton percale 200-thread-count sheet set from Lauren Ralph Lauren, making it a charming choice for your master or guest bedroom. It pairs effortlessly with solid and printed pieces alike. This 4 piece full size luxury sheet set is white, with blue marlins and the Tommy Bahama logo. Tommy Bahama designer bedding is known for superb quality and comfort. This bedding set is 100% stone-washed cotton percale, is soft to the touch, and is breathable and comfortable at night. 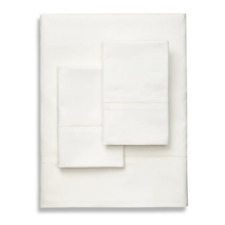 PILLOWCASES by DELANNA, 100% Cotton Percale Weave Standard Size 20" x 30"
Make your bedroom nice and cozy with this 4-piece 100% cotton percale sheet set. Choose from various sizes and beautiful prints that will have you snuggling up in style. Give us a shot and we will make sure that you will look to us again! 2 Standard Pillowcases. -Machine Wash. THE FINE PRINT. Retail $95. 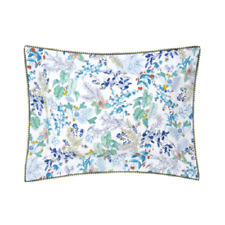 Two Peacock Alley White King Pillowcases 100% Cotton Percale 200tc. Condition is New with tags in package. Shipped with USPS Mail. 2 Peacock Alley White King Pillowcases 100% Cotton Percale 200tc - NEW NEW in packaging 2 King Pillowcases Peacock Alley Each measures 20" x 40” 100% Cotton Percale 200 Thread Count Color: White All items are stored and shipped from a smoke free, pet free environment. 1 flat sheet, 1 fitted sheet, 1 standard pillowcase. 100% Egyptian cotton. Size 21 in x 32 in. Machine washable. We are willing to work with you to resolve any issues you may have. Manufacturer: SERENDIPITY. Specifications 4-piece set 100% cotton 200 thread counts 1 queen flat sheet: 94 in x 104 in 1 queen fitted sheet: 60 in x 80 in 16 in pocket 2 standard pillowcases: 20 in x 32 in. 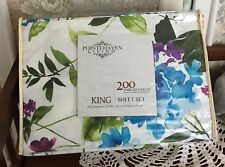 POINTHAVEN KING SHEET SET Percale COTTON Bold FLORAL Primavera 200 TC NEW! These Percale sheets are wrinkled when dried, but if you take them out while still warm and either fold them or put them right on the bed, the wrinkles fall out substantially. I never iron mine. Love them! One KING flat sheet 108" x 102". ---One KING fitted sheet 78" x 80" (fits up to 14" thick mattress). ---Two KING Pillowcases 20" x 40". -Machine Wash. Classic pink! THE FINE PRINT. Wamsutta Cool Touch Percale Sheets are perfect for staying cool on warm nights. 100% Egyptian cotton with a 350 thread count and percale weave. Machine washable. Made from 100% Egyptian cotton. Model: Light Turquoise/Seafoam Green Mini Hula Girls and Palm Trees on Off White Background. 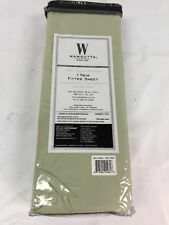 Two (2) Standard Pillowcases - 21x32in. • C risp and tailored, 100% long-staple cotton percale pillowcases featuring. Italian-Spun Cotton Percale with. probably the nicest 200-thread-count percale sheets you'll ever feel. King Pillowcases, Pair. New & sealed. 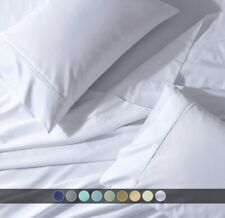 Material: percale from a blend of 50% Fortrel polyester & 50% combed cotton. Contains 1 fitted sheet to fit mattress size 54 x 75. 180 thread count. Actual color may vary due to lighting conditions. 100% Egyptian cotton. Finished size 66 in x 96 in. Fits mattress 39 in x 75 in. Machine washable. Cool & crisp sheet. Durable wash after wash. We will take care of the problem quickly and give a fair response. This is the Petite Fleur Collection, by Sferra. Incredibly Rare with hand embroidery style. Stunning embroidery on magnificent 475TC cotton percale. Fitted sheet is 13” deep. The 100% cotton percale is super smooth and cold, exactly how percale showily feel like. Manufacturer: SERENDIPITY. Specifications 4-piece set 100% cotton 200 thread counts 1 flat sheet: 86 in x 96 in 1 full fitted sheet: 54 in x 74 in 14 in pocket 2 standard pillowcases: 20 in x 32 in. All White sheet set with small silver gray embroidered trim as shown. Factory Folded - classic sheet set. Flat sheet is: 94" x 116". 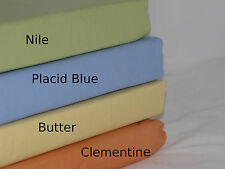 NEW Garnet Hill Fiesta "Citrus" Double/Full Fitted Sheet, made from Long Staple Cotton Percale. 200 thread count. Color Purple. 300 Thread Count / 100% Modal. Fits pillow size 20 in.x 36 in. 180 Thread Count. Durable and usable wash after wash. 55% Cotton, 45% Polyester. Manufactured for the Hospitality Industry. May also be used by Assisted Living Centers and for Personal Use. 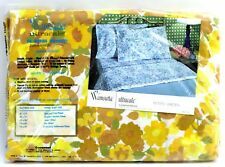 Springmaid Wondercale No-iron Percale. Bleach safe. Machine wash, tumble dry, no ironing. Stays soft and luxuriously smooth even after repeated washings. Stays neater on your bed because it's wrinkle resistant. FABRIC: 100% COTTON PERCALE. Machine Wash Warm. Do Not Use Bleach. Sierra 350 thread count long staple. Heralding a classic Greek motif, the chain embroidery creates a distinctive look for a perfectly. NOS NIP Fieldcrest pillow cases (2). Size 42" x 36" before hemming (21" x 27" pillow). 100% Egyptian cotton. Finished size 66 in x 96 in. Fits mattress 39 in x 75 in. Cool & crisp sheet. Durable wash after wash. Machine washable. We are willing to work with you to resolve any issues you may have. Martha stewart standard sham. You are getting a total of 2 pillowcases. Item Weight: 8.8 ounces.